Wow, feast or famine as they say. I either can't think of one item to post, or I have a "grocery list" of posts. Right now I have that grocery list. 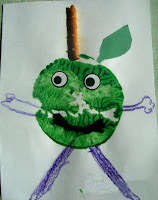 My son's kindergarten teacher has been gracious enough to allow me to post some fun things she does with the children. 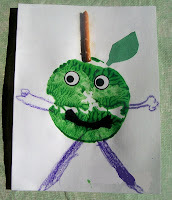 She just sent home her "apple people" that the children made with apple prints. They are very cute. Each child makes one apple print. When they are dry, they glue on a piece of pretzel stick for the stem, a leaf shape, she used the black yarn for a smile, and eye stickers(you know me, I love those wiggle eyes). Then the children took a crayon and added arms and legs. Very cute.